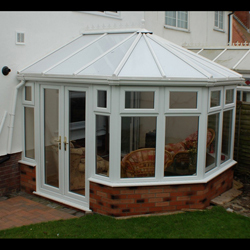 Synopsis: We purchased a new Victorian 3.5m x 3.5m build your own conservatory from diy2go in August 2013. Not being a builder I found the experience very rewarding. With the help of a friend we completed the basic construction within 4 days. We had purchased both a dwarf wall conservatory and the steel base which came in two shipments. Deliveries were handled extremely well and I was keep well advised by the delivery personnel...... Please click above to read full testimonial.